Nice! Do weeds get sucked into the chain? If so it could be said to have a weeding feature. A use for all those electric bikes that have been littering cities in recent months. I was thinking the same thing pick them up and harvest the motors and batteries from them. Had tried making something like this out of hoverboard electronics. Was pretty awesome, also envisioned something like ‘put everything on wheels’ and they follow you around. The guts of a hoverboard are awesome, and you can control via the ever popular arduino. Tried using accelerometer to control speed – was kinda touchy. I agree with you, the 3KW motor should be right around 4HP, that seems excessive given a human used to be able to hump the load unassisted. You may run into other issues as well. You have the weight of the motor and the batteries that the wheel, bearings, axle and frame need to deal with, and the fact that most wheelbarrows are meant to be pushed by humans. What I mean by that is the frame and the tub are not ultra strong because they know that a human will be pushing it. Add a motor and fill it up with a half ton of gravel and something is going to give. I’m going to argue that other problems with the traditional wheelbarrow (imbalance, and lifting of the load via a second-class lever) are equal if not worse than the challenges of rolling it somewhere. To solve all of these problems (and likely make it more fun to use), creating an electric “Dumper” would be in order. 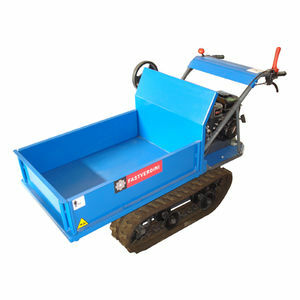 These are commonly seen on construction sites with both tracks and wheels, replacing the injury-creating wheelbarrow. Interesting although the wheelbarrow has two advantages. More maneuverable down narrow paths, and close quarters. If you build outdoor stuff and have much land you might be surprised at how often you do push a wheelbarrow over a plank, even if the plank is just laying on the ground. Much less bumpy and the wheel does not dig in. If I ever come across one of those Sears snowblowers with the tracks(free), building one of those would be a great project!